Open office spaces are not new — they’ve been around since prior to the 1950’s, when people completing similar, repetitive tasks like typing and clerical work all worked in shared spaces. In theory, the idea is a good one. 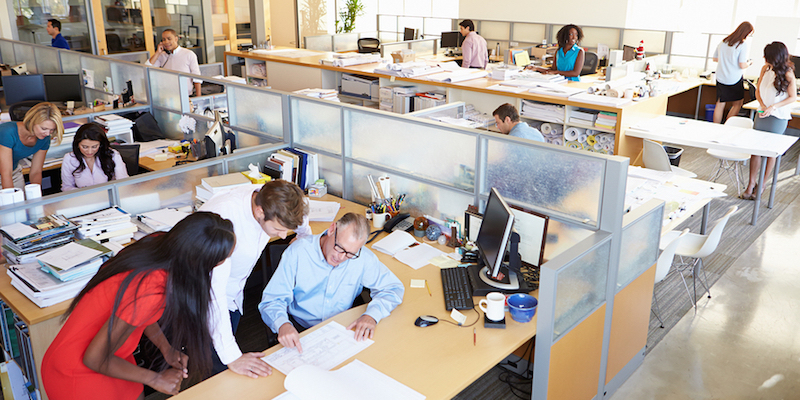 Open office plans allow for more collaboration and keep employees on the same playing field by ending the “who’s got the bigger office” competitions. Now, 70% of office spaces in the US are designed with an open layout. Many companies find that open office spaces enable employees to feed off each other’s energies, relax and have fun, and be able to work on projects that require more interaction. For productivity, however, open office spaces have proven to be less of a benefit. There are many studies that have shown that employees in open office spaces are 66% less productive, more nervous about what they say, more stressed, sicker, and overall more dissatisfied with their working environment due to noise and lack of privacy. Open offices have been shown to be a great advantage for those needing assistance, but a huge productivity killer for those who provide the assistance. If your employees are in an open workspace, or you have remote employees that take advantage of coworking spaces, then they will need to find ways to focus. Here are nine tips, tools, and resources that you can suggest in your company to help. Adding additional monitors to a workstation might sound like the opposite of focus. But allowing employees to have two or even three monitors may help them stay more focused on their work. Why? Especially at desks without dividers, it’s easy for motion outside in your peripheral to catch your eye and your attention. When you are working with more than one monitor, your eyes will have more workspace to focus on, limiting the amount of peripheral areas. As an added bonus, it will help employees who need to look at more than one application at a time save time by having them all open and easily viewable, instead of having to go back and forth between them. Some employees may feel like wearing headphones in an open office space is rude or counterintuitive to the point of the open office space in the first place. This is why you should suggest that employees invest in some quality noise-canceling headphones. It will effectively give everyone permission to buy them so they can start focusing on their work. If you want to give specific suggestions, recommend noise-canceling headphones that have microphones or headset-like features built in. That way, employees can go from listening to music to a customer call if needed. If your company has the bandwidth, share your favorite streaming white-noise stations online like Calm or RainyMood. If your bandwidth is not as forgiving, suggest that employees download their favorite white-noises from iTunes and play them locally on their machine instead of streaming them. Boundaries are important in all aspects of our lives and relationships, including those at work. Encourage all employees to set specific boundaries for themselves. It could be a company-wide initiative, such as designating certain hours as focus hours, or it could be an individual thing, such as some employees noting that they would preferred to be contacted via chat than have people visit their desk. In addition to the formal conference room for scheduled meeting, create meeting spaces in your office that small groups can gather in informally to have conversations or impromptu brainstorming sessions. This will keep the noise level in the main workspace down so everyone not involved in the conversation can focus. Think of it like a library inside a university. It can be a large room that houses the company library that doubles as a space where people can go to concentrate on reading reports or writing out notes. It should be a computer / laptop free room so it is even free of the sounds of typing and conversation. Giving employees an area where they can take a break from their computers will give them time to let their eyes relax from the glow of the monitor. It may also help them channel more creative thought through handwriting and doodling. You can’t blame all productivity issues on the layout of the office. Distractions can happen inside the cubicle as well as outside. Consider giving your employees tools to help reduce distractions on their computers to help further increase productivity. For example, instead of blocking access to certain websites, suggest that employees use browser tools like StayFocusd to limit their time on distracting websites like Facebook or others. This will give employees the freedom to manage their time without feeling like they are being restricted, and it will give them access to resources that would have otherwise been blocked from them, such as the ability to get advice from professional Facebook groups or blogs. If you’re not working in the open space, but your employees are, then you will need to allow them to make their own suggestions. Chances are, many of them will have great ideas on ways to further help make the open office space one of both collaboration and productivity. You don’t have to do away with your open office space to help your employees get more focused on their work. Just encourage them with these tips, tools, and resources to help them discover a way to increase their own productivity.